There’s a certain joy in “doing it yourself”…..and another one entirely in finding someone else to do the work. 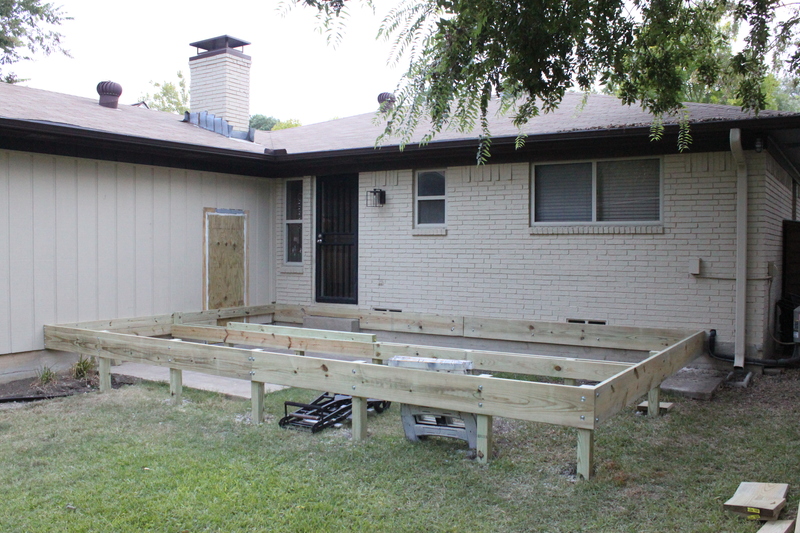 Take our deck…that’s right, we have a deck now. 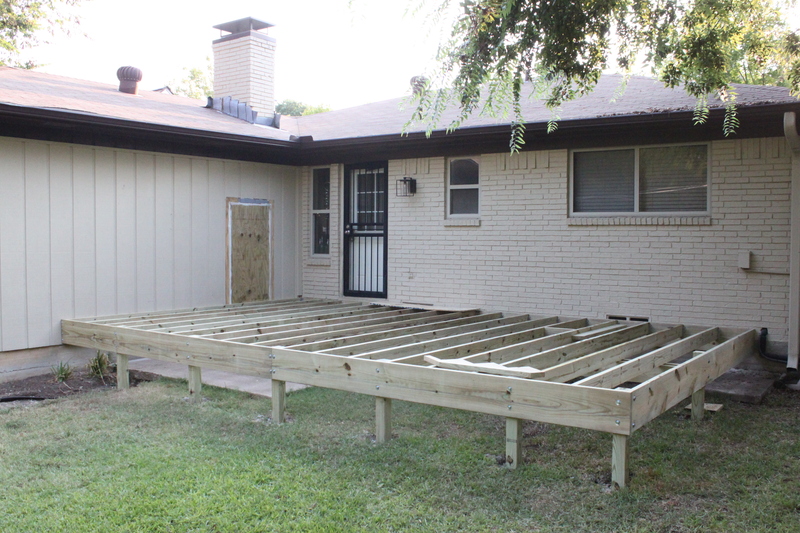 300 square feet of “full deck”. Took about a week. Every evening when I got home from work, I snapped a few shots of the progress. Our neighbor Mike, and his company – Tubirds Construction, built it for us. Mike was telling me that after a decade of flipping houses in Oak Cliff, he finally decided to live in one. He settled about 2 blocks from us. When Mike came down a few months ago and gave us some much-needed advice on the bathroom remodel – YES, we are still working on the master bathroom – Jamie started questioning him about us building a deck. How difficult would it be? Could we built right over the existing slab and steps? Should we attach it to the house? How long should it take? Could we eventually convert the windows to french doors? And most importantly, how much should it cost? So, now……. we have a deck stretching across the back of our house. It’s like having a whole new room…..
We can’t wait to stain it, and style it with all the patio furniture we’ve been hoarding in the garage. Maybe string some rodeo lights over it. 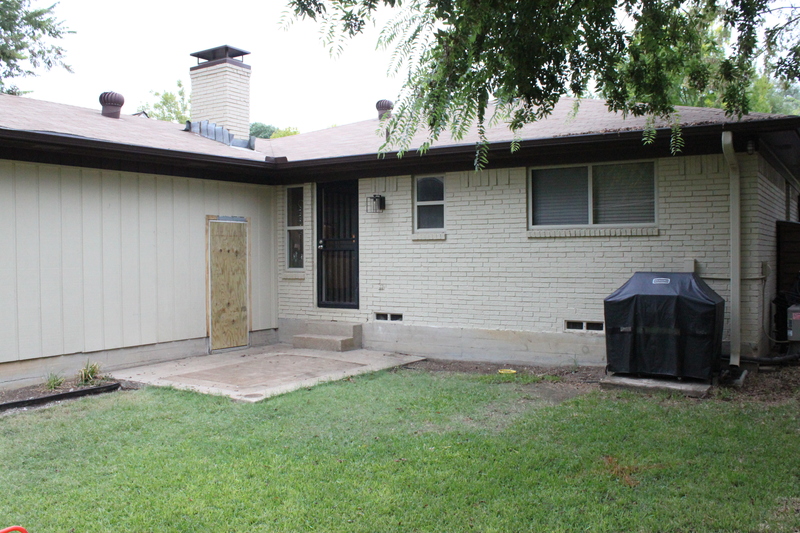 There’s even a plan to replace the back door and the master bedroom windows with accordion doors. Wheels are turning, folks. Wheels are turning. OOOOhhhh. I’m shivering just thinking about all that awesomeness…..but there’s no rush. …..and we plan to simply enjoy it for a while. Now you got MY wheels turning! How lucky are you to go from start to finish in 1 week! I live here in the Texas Hill Country and you are lucky if you’re even able to get anyone else to LOOK at your potential project in a week. Looks just fantastic and I can’t wait to see ho you decorate it!! You two are VERY inspiring! Kim, we’re anxious to see the bathroom too. There have been a few setbacks…..but I have been commanded to finish before Thanksgiving…UUGgghhhh. We’ll start back up after Mexico this week, promise. Now if we can just have some cooler weather you’ll be rockin that fabulous deck! Hasn’t been too bad lately, low 90’s…..Fall is right around the corner though. Beautiful! We actually did install our own, ground level, and using my Father-in-law’s help, and it turned out marvelous. BUT, I was also excited to stain, and then I read up on it and you should really wait a year or two for he wood to settle and expel all the moisture from the storage process before you stain. It’s been a year since I researched it, but I was looking at TWP stains and I think that’s where I read about waiting. Good luck! Yeah, we planned on waiting for the wood to dry too…it’s still pretty wet. Probably stain in the spring. 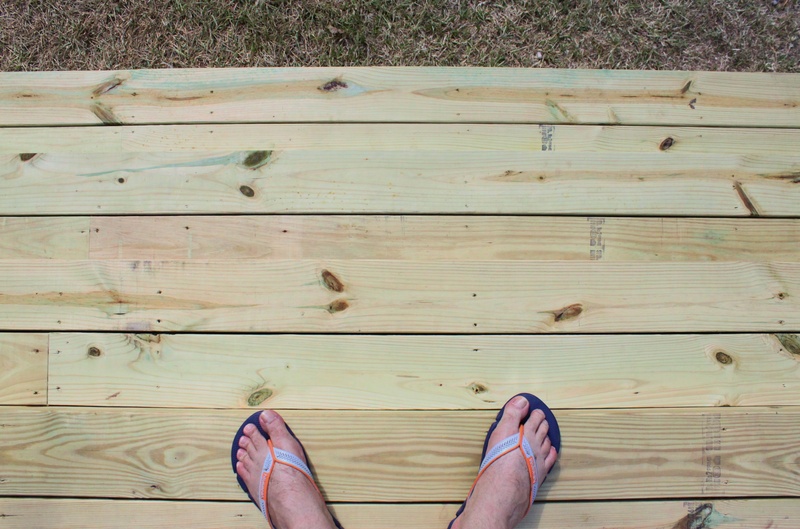 I love the simple lines of your deck, the better to deck it out (groan). Keep us posted. Double groan. 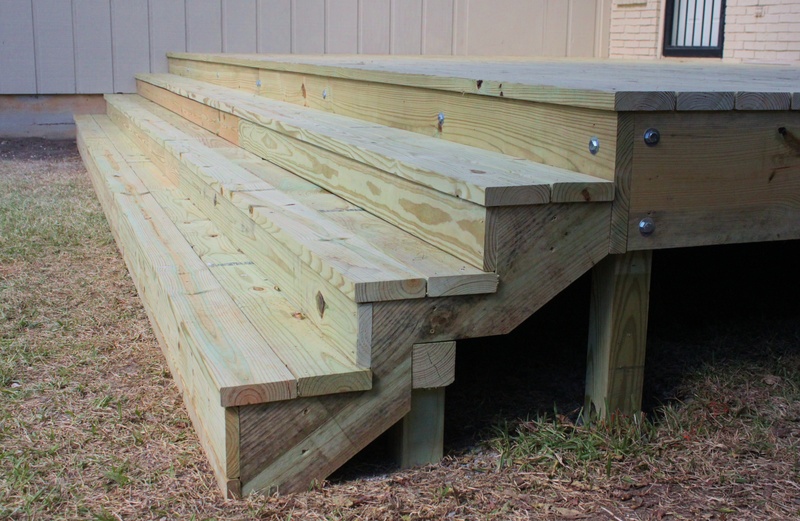 One clean rectangle, with an entire side of steps was all I wanted…..a rail seems too fussy. We’ll deck it out for blog pictures in the spring. That looks marvelous! 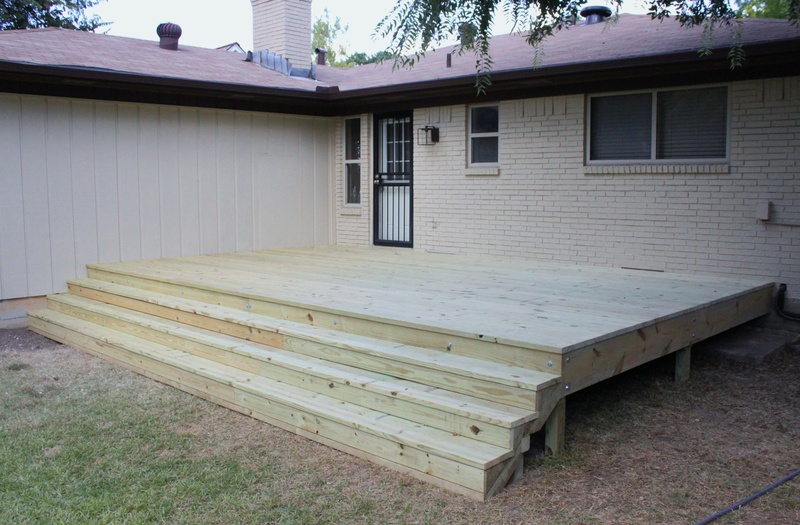 We’re talking about adding a deck, but can’t decide what to use. All the different products make our heads spin. sigh. Someone brought up “plastic wood” and I nipped that in the bud quickly. Gosh, I wish we lived next door to you two! Your posts are so inspiring and honest. You share the good, the bad and the ugly which is so great. Seeing how and when you do it yourself and when you let someone else do it for you is so helpful. It takes away that “I have to do it ALL myself” mind set, while still encouraging us to have a go at it. Love your style, love your blog. Thanks for letting us share the journey! Awww thanks Gayle. I’m glad that we could connect with you…..I honestly never thought people would be interested in our house/lives. This blog was a way to keep our mothers included in our house purchase…it’s evolved into a little more than that now. I plan on making this house exactly the way I want it to be even if it kills us both. 🙂 BTW, if you lived next door you could come over and enjoy a margarita on the new deck. Rush, rush! 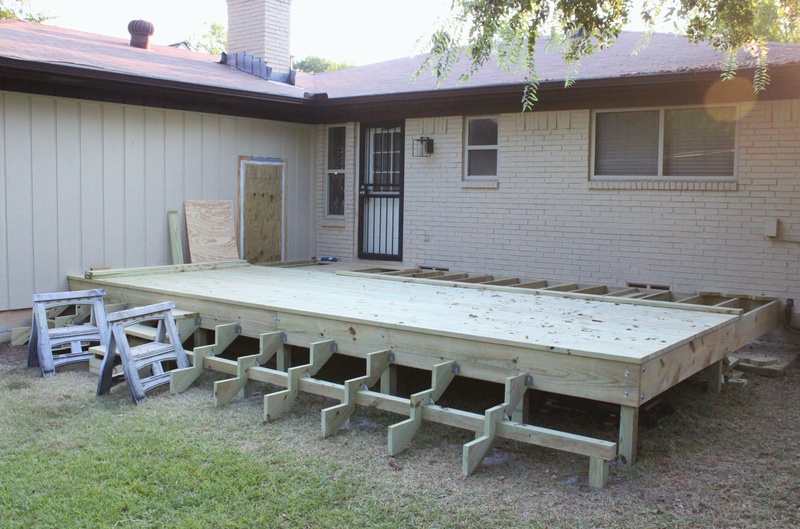 I can’t wait to see your deck all “decked” out! I won’t even mention the bathroom (but every time you post, I cross my fingers 😉 Good luck guys and enjoy the process! We here up north have a month or two of “pleasant” deck weather, maybe or it could be covered in snow in a week! So enjoy you fab Texas weather! We added all our patio furniture…now there’s room in the garage to move around. 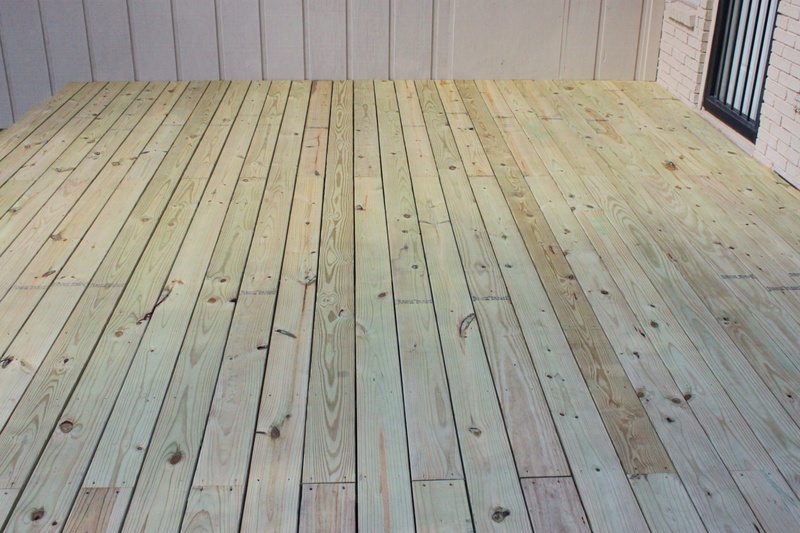 We’ll probably do an official “Styled” deck post after we stain in the spring. We’re looking for an outdoor sofa too. Have to have someplace to use all those pillows I’ve been hoarding in anticipation……..